The spectacular Nantahala Gorge, located in Nantahala National Forest, is one of America's favorite playgrounds for outdoor enthusiasts. It's located at the edge of the Great Smoky Mountains National Park, just a short distance from Cherokee and Bryson City. It's about 75 miles from Asheville (easy drive). 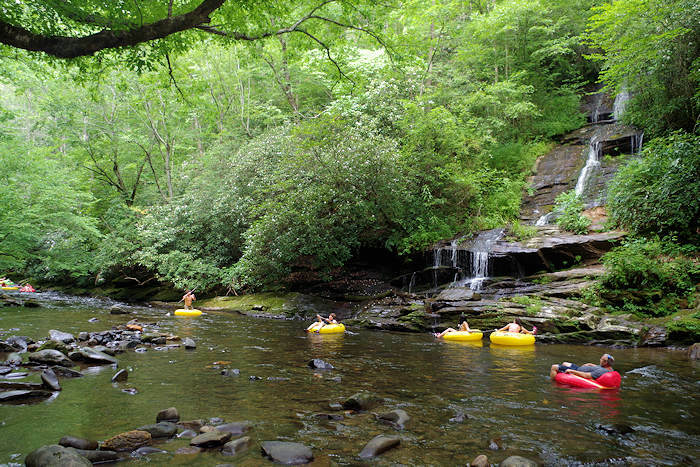 "Nantahala" comes from the Cherokee language and means "Land of the Noonday Sun." The river runs through a narrow and steep gorge where in some areas the sun only reaches the ground when it is directly overhead during the middle of the day. Making its way along the floor of the gorge are the white-capped waters of the Nantahala River, a mecca for whitewater rafting, kayaking and fishing. This beautiful river is a spectacle of wonder as it rushes along its nine-mile course then cascades into the tranquil waters of Fontana Lake. 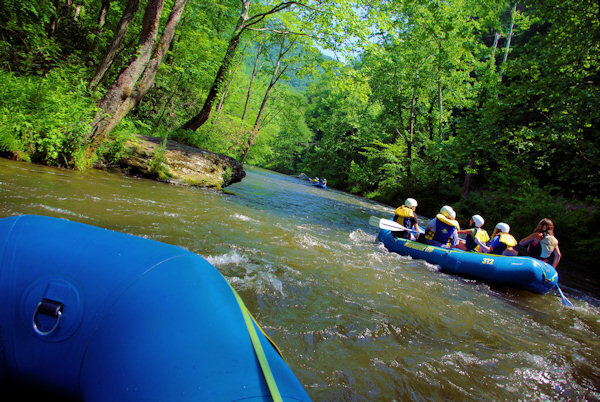 Clear cool water, constant waves and swift currents make the Nantahala River a delight for all ages interested in an exhilarating introduction to whitewater rafting. The trip takes over three hours and contains numerous class I and II rapids, with a class III at the end. Wildwater Rafting trips are fully guided. Since the Nantahala River is a dam-controlled river, one can expect good water flows at all times of the year. The trip takes over three hours and is perfect for first-timers. Click here to visit their Web site. If you are confident with your paddling skills and want to go at your own pace, a Wildwater rental trip may be for you. They provide the orientation, equipment, shuttle and use of their facilities. You are on your own on the river. Get 4 and 6 person rafts, as well as 1 and 2 person inflatable kayaks seven days a week. Wildwater provides all the gear, as well as transportation to and from the river. Click here to visit their Web site. Enjoy a soaring and gliding experience naturally fueled by a gradual elevation change at Nantahala Gorge Canopy Tours by Wildwater. It takes limited energy to participate and is not designed to scare with big drops as much as excite with smooth gliding. There are a few elevated "swinging" bridges to cross. But you are always attached safely to a cable. They certainly add to the adventure and fun! You are provided with state of the art equipment including helmets, full body harnesses, trolley, gloves, tether lines, and two canopy rangers per group. This is definitely a great course for beginners or experienced zippers. 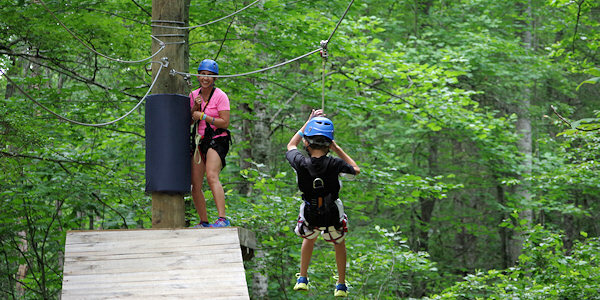 Enjoy an half mile of air time with three Sky Bridges and six transfer bridges, 13 zipline sections alternating between slope side, trees, and elevated platforms, and 20 scenic and unspoiled acres of flying area all within the heavily wooded setting in the Nantahala National Forest. An 85-foot overlook bridge provides vast views of the Nantahala Gorge, Lake Fontana, and the Smokies. Two new 500' long ziplines fly you 300' above Lake Fontana. 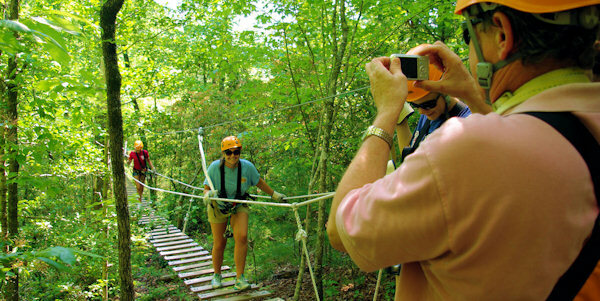 It's more than a zip line ride, since you will glide through multiple ecosystems in a deciduous forest packed with native flowering plants such as mountain laurel, dogwood, rhododendron, giant Frazier magnolia, rare umbrella magnolia, silver bells and many more. Click here to visit their Web site. KidZip is designed especially for children ages 4-12! Get two hours of all the zipping they want. The clever cable system keeps them locked in at all times. Small adults can go along. Or parents can watch all the action from an observation deck. There is much to do in this area. Wildwater makes it easy by offering many outdoor adventures, including whitewater rafting, zip line canopy tours, jeep tours, a train ride and more! With their Triple Adventure package, enjoy three guided adventures without moving your car! Click here to visit their Web site. This two-hour guided waterfall tour by Wildwater Nantahala Gorge Adventure Center takes you on a personal exploration up the mountain to some of the most spectacular waterfalls and lakes in the Nantahala area. Travel past beautiful lakes and up to the Appalachian Trail in a Jeep® Wrangler converted vehicle, with an extended rear to accommodate five passengers and a plexiglass canopy over the roof. Click here to visit their Web site. Enjoy this seven hour trip combining the Great Smoky Mountains Railroad trip with the Waterfall Jeep® tour by Wildwater. 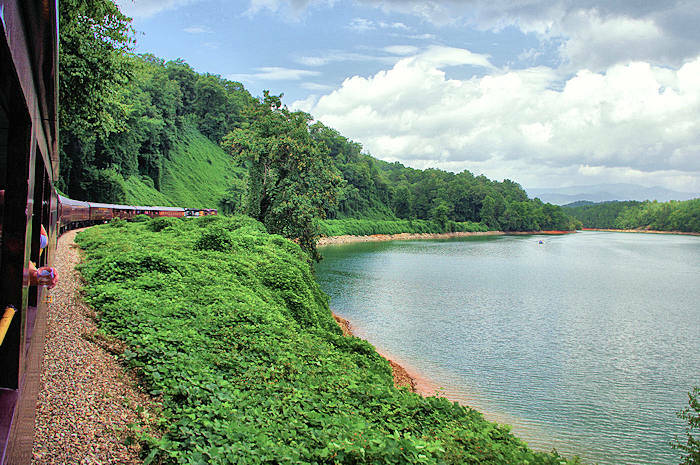 You'll begin your trip in Bryson City with a two hour train ride over Fontana Lake and into the Nantahala Gorge. At the top-of-the-line disembark from the train and climb aboard our customized Jeep® for a personal exploration up the mountain, past waterfalls, up to the Appalachian Trail and back down along Winding Stairs Rd, an old stagecoach route. Click here to visit their Web site. For a very memorable and unique time, stay the night at Falling Waters Yurt Village, steps from whitewater rafting and zip line canopy tours! 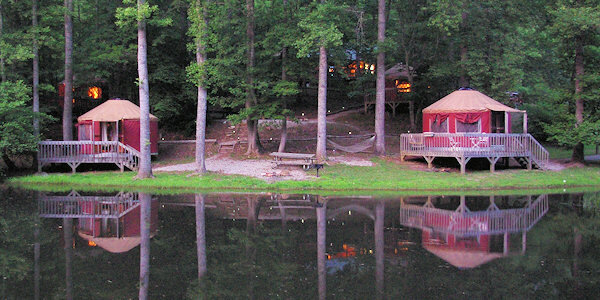 You could call it luxury camping or "glamping." The yurts are 16-foot diameter circular tent-style structures, with outdoor decks, skylights, french doors, windows, ceiling fans, queen size beds, refrigerators, stereo-CD, coffee makers, and polished knotty pine floors with area rugs. Amenities include water to each site, drink machines, laundry and a picnic area with grills. The yurts share private, lockable bathrooms with a stall shower, vanity and toilet. The bathhouse and laundry are located a short distance from the Yurts. Click here to visit their Web site. 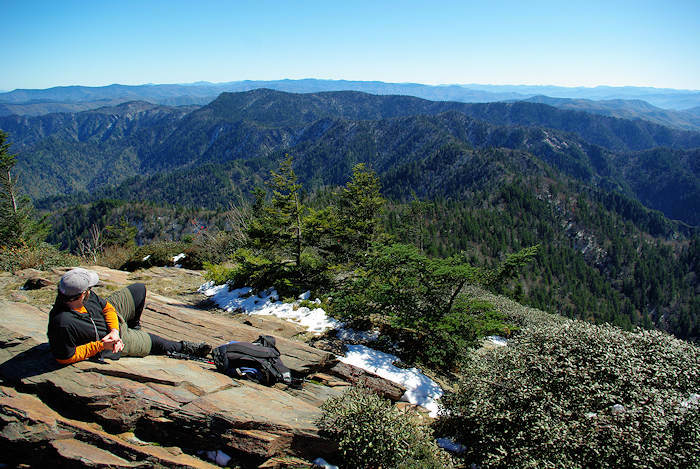 There are many area hiking trails in the Nantahala National Forest, including treks along the famous Appalachian Trail including Wayah Bald and Wesser Bald. Start out going West on I-240 West. Merge onto I-40 W via EXIT 31B toward Canton/Knoxville. Merge onto US-74 W via EXIT 27 toward US-19/Clyde/US-23/Waynesville/Maggie Valley/Franklin/Murphy/Atlanta. Merge onto US-74 W via EXIT 107 toward E Jones Cove. About 12 miles past Bryson City, Hwy 74 narrows from four lanes to two lanes. Go straight, staying on Hwy 74 West. Wildwater's Nantahala Gorge Adventure Center is 1.8 miles past the 74/28 fork on the left. Falling Waters Adventure Resort & Nantahala Gorge Canopy Tours are on the right across the street from our Nantahala Gorge Adventure Center. Read about their outdoor adventures in the Great Smoky Mountains along the Pigeon River. Read about their outdoor adventures near downtown Asheville.